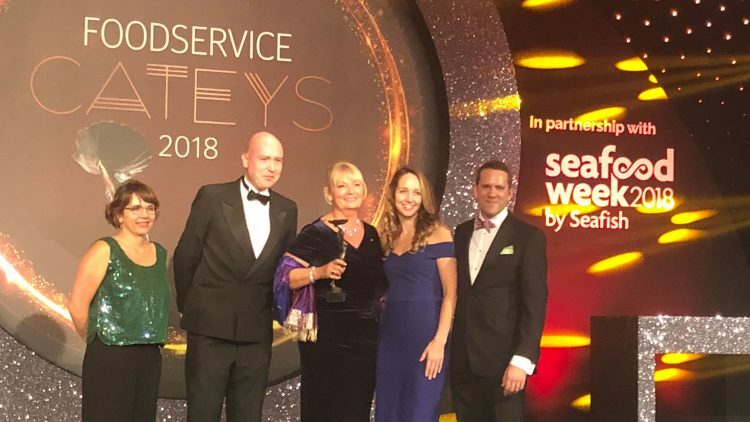 Wendy Bartlett, founder of bartlett mitchell, has been named winner of the outstanding contribution award at the Foodservice Cateys – one of the most prestigious honours in the hospitality industry. Wendy, who set up the company alongside Ian Mitchell almost 20 years ago, has seen the business grow from a small catering company running out of her second bedroom, to a £40 million turnover industry success story operating across the UK. The company, which is still an independently owned businesses, has become one of the most recognised brands in the sector, winning every major industry award as well as numerous accolades and accreditation. Most importantly, the business has created jobs for approximately 1,000 people, becoming a major contributor to the growth of the hospitality sector. She was presented her award in front of more than 500 high profile guests from across the foodservice sector at a ceremony held at the Park Plaza Hotel in Westminster, London. Wendy, who also sits on the board of UK Hospitality, said: “I’m incredibly proud to receive this award. It’s safe to say that the last 20 years have been an incredible time for me and my colleagues. It sounds clichéd but this really means so much to me because it is also recognition for the brilliant people we work with everyday.